^ 7.0 7.1 婦女救援基金會 互联网档案馆的存檔，存档日期2008-05-01. 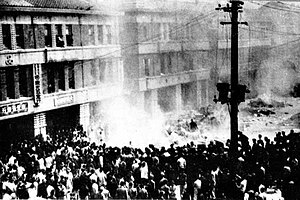 ^ Formosa killings are put at 10,000. New York Times, 1947年3月29日. 1947 [2008-06-18]. （原始内容存档于2006-04-24） （英语）. This page is based on the Wikipedia article 1940年代臺灣; it is used under the Creative Commons Attribution-ShareAlike 3.0 Unported License (CC-BY-SA). You may redistribute it, verbatim or modified, providing that you comply with the terms of the CC-BY-SA.